We’ve also featured other fighters on TKO 37’s card such as Lindsay Garbatt & Derek Falk so keep checking back to see new photos, pics and articles about local Ontario fighters. Every MMA fan has seen a bad stoppage in their day, whether too late or too early, sometimes things go poorly for the ref. 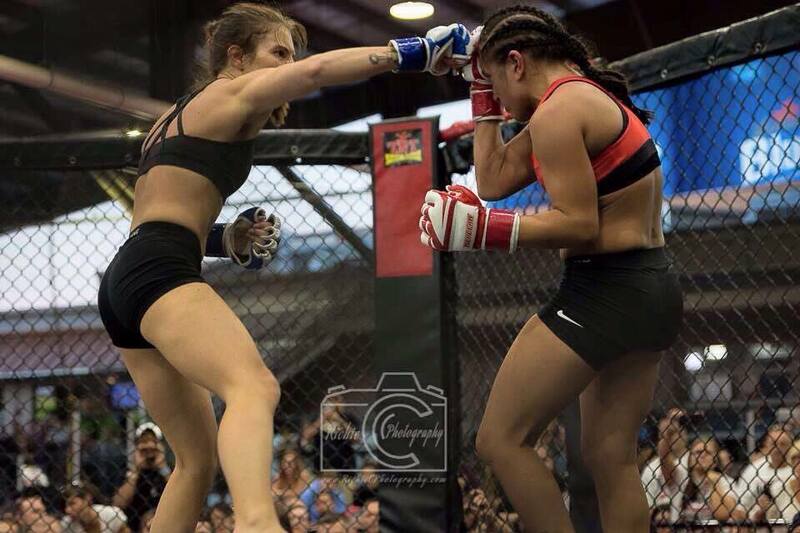 Imagine starting your career in MMA that way and you will know exactly what Ashley LéTournéau went through. While doing research for this article, I discovered what was one of the worst stoppages I’ve ever seen, and despite it being an amateur fight, it was still unbelievably bad. Add in that the referee made a rather unprofessional mimicking of the “knockout” and perhaps you will understand the amount of demoralization that LéTournéau likely faced after that. One of your first notable fights, you get knocked down, look ready to defend yourself, and the ref stops it; ‘I can never get that back’ is how I would feel. But in reality she did. The young prospect avenged that amateur loss against the same opponent, later winning a local tournament to cap off her amateur career. Now it’s time to move to the Pro Circuit, starting with TKO 37, Jan. 13th in Montreal. Bullied as a child for her smaller size (she usually fights at 105 lbs.) LéTournéau had her work cut out for her at an early age. As with any child, some helpful advice and school assistance were prescribed to her to try and dissuade further bullying. It’s a fairly shocking image to paint in your mind, let alone experience. Yet Ashley talks about it casually as just another day, perhaps revealing what bullying can do to a kid. From there the Napanee native persevered, starting a body of work in athletics/martial arts that is rarely seen in Ontario, if not the country. Possibly the most diverse fighter we know of coming out the region, far beyond her years in experience and seemingly destined to become the biggest name her town has to offer; assuming she would KO pop singer Avril Lavigne. From a marketing internship with Hayabusa Fight Wear which she mentions really helped her see the “business side of things” in MMA equipment, to becoming a coach/teacher out of Diamond Fitness, one of the main reasons we are featuring Ashley on SBF is how well-versed she is in multiple disciplines. How well disciplined you ask? Enough to teach wrestling and kick-boxing which are no simple sports to train. Having competed in kickboxing/muay thai, MMA and as a decorated high-school wrestler, LéTournéau has a huge upside given her age and competitive experience. She even has weight cutting and high-level fitness acumen having competed in the fitness field. SBF: What about weight cutting for example? Did that help, how much do you usually cut? AL: Weight cutting for me isn’t a huge deal when I fight at 105 pounds because I walk around at about 107. But for TKO 37 I have to put weight on to get to 115. I’d like to fight at 105, King of the Cage and Invitca have that weight, but I’m going to take advantage of this opportunity at 115. LéTournéau has been hard at work with weight training to get to 115 pounds, and at 5’1 and one-half inches, it’s no easy task. Since we spoke, she announced on her Facebook that she has made it up to 115, well in advance. While the added poundage has made cardio a bit harder, Ashley’s sports pedigree will allow her to adjust, considering she runs 10k “whenever [she] can”, I think she’ll be just fine. No one just casually runs 10 kilometres from time to time, haha. We got the chance to ask Ashley about the state of the sport in Ontario, something we’ve been sure to lend an ear to in recent interviews with Justin Bruckmann to name one example. She echo’d some of the same displeasure many have had with the Ontario Athletic Commission despite their recent sponsoring of UFC 206 in Toronto. Chiefly, LéTournéau disagrees with certain aspects surrounding fight week. One being the same-day-weigh-ins. Which seems rather odd given how the big leagues, i.e. UFC has made weight cutting less harsh on fighters’ bodies by allowing them to weigh-in earlier in the day, the day before fighting. It seems ludicrous at this point to make athletes weigh-in and fight on the same day, dangerous even. Maybe that’s why TKO MMA is the best opportunity for the new strawweight, or maybe that’s why her home gym has started their own promotion. Nonetheless, this talented individual looks poised to make a mark for herself in January against a crafty opponent.